Belgium is the land of comic strips. You can experience this in Antwerp. Discover the city in a different way by hunting for comic strip walls. 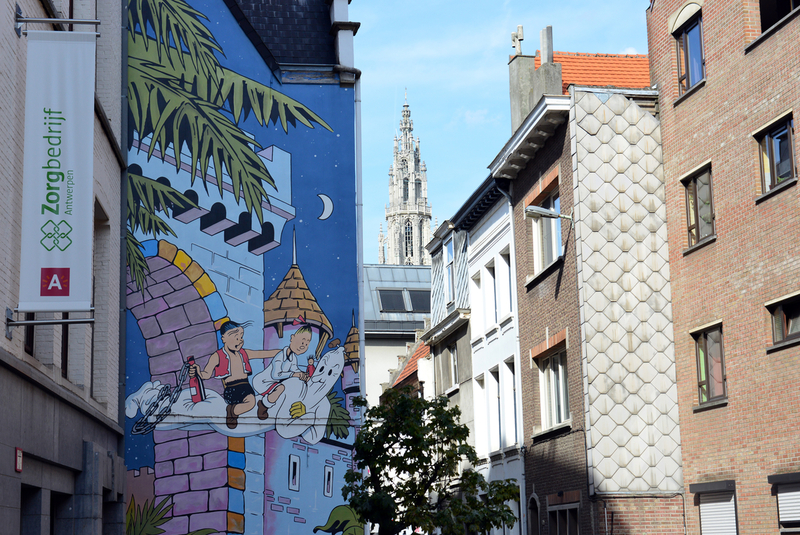 During your search you’ll explore various neighbourhoods and before you know it you’ll be standing in front of one of the ten towering murals in Antwerp. Antwerp’s comic strip walls project, Muurvast, gives boring, poorly maintained or heavily tagged walls a colourful face-lift. The monumental murals are pleasantly surprising for visitors and Antwerp residents. Hendrik Conscience with a surprised expression comes to life on this wall. Instead of water, letters flow out of the fountain; a reference to the career of the artist. The wall shows the cover of the Spike and Suzy album “Amoras/Amphoria Island”. When you stand in front of the wall you see the beautiful cathedral behind the comic strip wall. The comic strip shows ‘nature in the city’. The comic strip characters have purchased plants and flowers and the drawing evolves into a woman in an earthly paradise: the open air with pure water. Paradijsstraat:“Kiekeboe” MerhoThis comic strip drawing is linked to the university neighbourhood where it is located. Daughter Fanny cycles to school with her books. We see comic strip character Cordelia studying in different poses in the university neighbourhood. This wall shows the cover of the comic strip story ‘Cheese’. You see the protagonist ‘Laarmans the Great’ cross the market with cheese balls in a bag. In the background you see Antwerp’s town hall and Brabo statue. Leopold de Waelstraat:“Louis Armstrong” Philip PaquetThe drawing above wine bistro Patine refers to the jazz musician Louis Armstrong, a tranquil reading moment, and the Museum of Fine Arts. Jommeke is one of the greatest Flemish comic strip heroes for small children. The wall is a tribute to the author Jef Nys. It’s located in the ideal spot with lots of schools in the neighbourhood. The artist steps away from the traditional division of comic strips and colours outside the lines. This results in bubbling, colourful ‘comic parties’. De Kloosterstraat:“Nero” Marc SleenThe comic strip wall shows Nero on the way to the North Pole. It also shows scenes of the port, tugboats, the Scheldt River quays, and the typical Scheldt River hangars. Download the map and start your search. You would like to do the walk with a guide? No problem! Linda Torfs, organiser and driving force behind the route, will gladly explain the development of the walls, the choice of artists, and the project’s evolution. The full walk goes past ten comic strip walls, through five city neighbourhoods, past two pubs and takes three to four hours to complete. Make a reservation on: 0478 294 685 or lindatorfs@telenet.be.